Japan making strides: Perhaps the biggest storyline from the contest was the pressure that Japan put on Team USA. Former Riveter Nana Fujimoto was phenomenal in net, stopping a whopping 49 shots to hold the United States at bay. But Japan’s effort was impressive all game long, as they held the United States off the board for most of the first period until Hilary Knight (CWHL Les Canadienns de Montreal) broke the ice with 3:12 left in the frame. 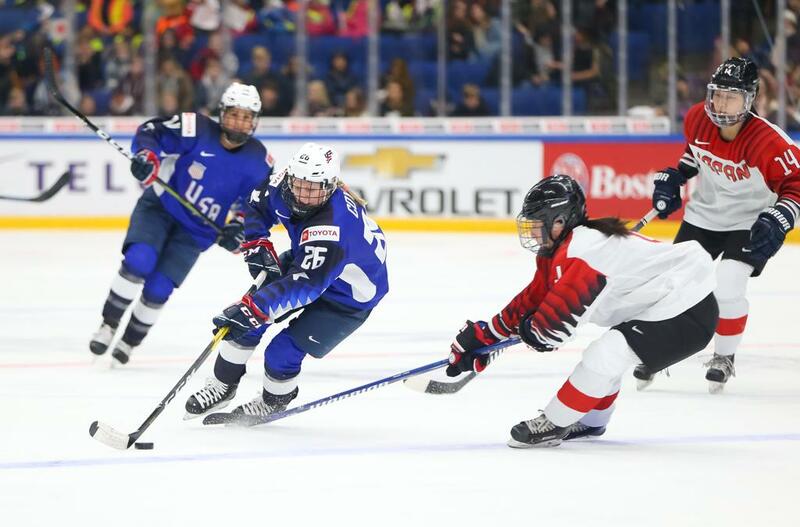 Captain Coyne keeps contributing: Team USA captain Kendall Coyne Schofield (NWHL Minnesota Whitecaps) continued her impressive tournament, extending her point streak to five games, netting Team USA’s fourth goal midway through the third period. The best defense is a good offense: Team USA has not allowed a goal since it’s game against Canada, with its shutout streak now over 200 minutes. Maddie Rooney and Alex Rigsby have been stellar in net for the United States, with Rooney picking up the shutout against Japan. The United States has outshot its opponents, 154-28, in that three-game shutout streak, making puck possession the name of the game. The best offense is a good defense? : Team USA’s forwards have been firing on all cylinders all tournament long, but the United States’ defenders have made a habit of getting on the scoresheet as well. Cayla Barnes (NCAA Boston College) had a goal and an assist in the quarterfinal win and now has six points (2-4-6) in the tournament. Megan Keller (2018 Buffalo Beauts draft pick, third overall) and Michelle Picard (NWHL Metropolitan Riveters) each picked up an assist. All seven of Team USA’s defenders have gotten on the scoresheet and have combined for 22 points this tournament. Team USA awaits the winner of the quarterfinal matchup between Russia and Switzerland for a semifinal on Saturday.